I find myself in one of the streets leading to Piazza San Marco, the passage becomes impossible due to the bodies of strangers trying to reach opposite directions. I am fascinated and overwhelmed by the force of attraction and repulsion directing those bodies who look like irregular waves. Someone tells me that during the New Year’s day, the midnight kiss is a tradition. I am in the studio of an artist is taking place an auction where is possible to win some artist's personal objects in exchange for an extemporaneous proposal. I win 1981 Venice postcard with the proposal to use the phrase on the card as the title of a future work. 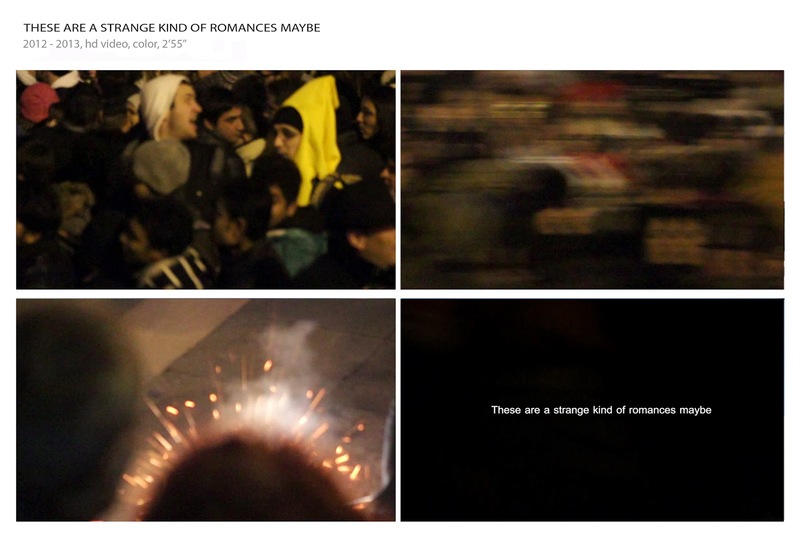 The sentence is "These are a strange kind of romances maybe", December 31, 2012. Venice, December 31, 2012, 11.00 pm. I return to Piazza San Marco. HD Video , 2012 - 2013, 02’55”, color, NO sound.